Chasing that Swedish supermodel look may be a bit harder than initially thought, after all surely all it takes is blonde, smooth skin, blue eyes and a glowing complexion. I have succeeded in two of the four. ‘You are glowing’… in the right context, these are three words to brighten a woman’s life and were what I heard as I sat down to brunch with friends. A mimosa in and I was racking my brain for what was different, what was new, with my thoughts turning to my LUNA Mini 2, the facial brush that is as easy as 1, 2, 3. 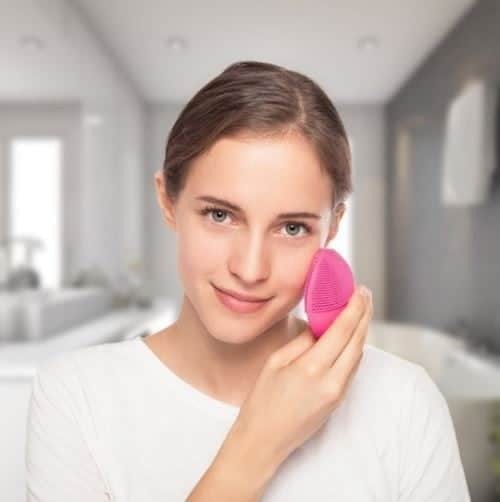 Tempted into trying the LUNA Mini 2 as the days and years of youthful wash-and-go have gone by, it is the cleansing brush that delivers the promised glamour. Using it twice a day for the past two months – starting at night and then building it up to twice a day as I wanted to see if my skin reacted, my face has never felt so super clean, so super soft. The revolutionary LUNA Mini 2 uses silicone bristles so you don’t have to replace the brush head while always maintaining a hygienic field of play. And even for us more sensitive souls, it is gentle on the skin with its longer touch-points that extend reach and enhance softness. Eight settings ranging from intense to lighter to even lighter means it delivers a customised cleansing for those I-didn’t-leave-the-house-days to the I-did-all-the-housework-days. A twice-daily facial massage is all it takes for a fresh, clear and even-looking complexion. One hundred percent waterproof, you can take it in the bathtub, the shower, or even throw it in the pool if that’s your thing. So this beauty brush really works? You’ve got to hand it to FOREO, they’ve designed a device that does what the packaging says. Now, if only I could get rid of the crow’s feet stomping around my eyes, maybe then I’ll be a bit closer to that Swedish supermodel look.